This is a repost...but one with very fond memories...enjoy! As we approach July, I am reminded of a 4th of July a few years back, very untraditional in the American sense. There were no hot dogs, hamburgers, and fireworks for us that year and I don't recall missing them. 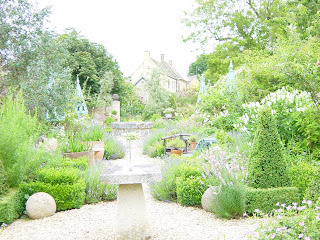 We spent the day in England, in the Cotswalls to be exact. 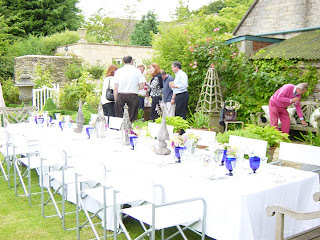 Our 4th of July consisted of lunch at the incredible country home of friend and designer William Yeoward. 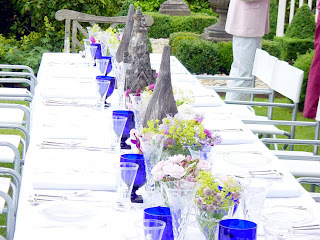 His gardens alone sent me into visual overload, not to mention the tablesetting for lunch and it did not end there...the day continued with a tour of the private gardens at Highgrove and a fabulous black tie dinner with Prince Charles and Camilla. Well, back to reality, hot dogs, hamburgers .....the good ole American 4th of July, and my fond memories of a Cinderalla story.